A little something for everyone. The Welsh Club is a very established and well respected club. It has an amazingly eclectic array of nights playing everything from motown to punk. It also plays host to a lot of accomplished live acts. 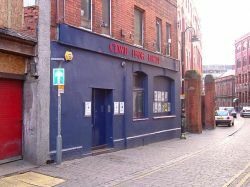 Clwb has three floors all usually playing different styles. Floors 1 & 2 are quite small but there is still plenty of space to sit down and relax or get up and boogie. Floor 3 is quite large and can easily fit 300 people or so and also plays host to a lot of live bands. Tuesday is Rebel Rebel and Rock Inferno, clwb's very own rock night. The music is quite hard but the atmosphere is very friendly and there are quite a lot of people who like to make an effort. If you can call fishnets, eye make up and black nails making an effort, and that's just the boys! If you like punk, glam rock and metal this is the night to let loose and descend upon town in full goth/cyber punk glory. Wednesday is Cheesy Club downstairs and Popscene on the top floor. Cheesy Club has a Motown & Funk flavour and has to be said, is one of the best nights in Cardiff. The music is stunning and the atmosphere is always warm and friendly, with everyone out to drink, dance and have a good time. Popscene is equally as good. The music has an indie rock vibe, playing everything from The Stone Roses to The Chemical Bros. All in all, Wednesdays are a very popular night for Clwb and well worth a visit. Thursday night is either Uprising or plays host to various up and coming bands from Wales and the UK. Uprising is the resident reggae and dub night. If reggae and dub is your thing, then check it out, as I have heard from reliable sources that it is well worth the £3 entry fee, and as Cardiff's only dedicated reggae night, there is not a great deal of choice in the matter. Fridays vary from week to week but it is always worth checking in to see what's on. There are three nights running on Fridays that I would especially recommend. The first is Holodeck, pure techno joy. Holodeck has been running in different locations around Cardiff for 4 years and has been going from strength to strength. The second is Silent Running, a high quality drum n bass night which never fails to disappoint. Lastly but by no means least there is Sumo. Breaks and beats are the order of the day here. Sumo has a good reputation for getting good DJ's and playing even better tunes. Well worth a visit. Whatever the night, or whatever your taste in music. Clwb Ifor Bach is by far the most eclectic club in town and well worth a visit, just make sure you get the right night.